Our efforts in December and the early part of January were to push back and show that citizens care about repairable products. We were relieved to learn that the UK would not play a blocking role, and joined Brussels-based partners to ask EU member states to stand for our right to repair. Massive news coverage last week in the UK, and globally, helped generate new interest. The season of votes is now over for major appliances, including fridges, televisions, dishwashers and washing machines. (The new regulations will be officially published after scrutiny by the European Parliament.) Meanwhile we welcome the historic precedent set out by these new regulations, despite some disappointments which the repair movement will have to focus on in future. 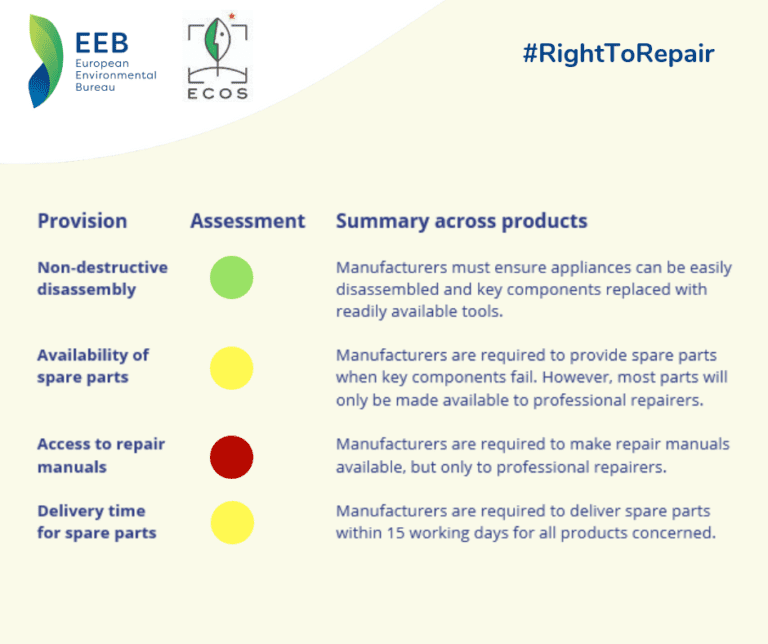 Member states did set the precedent for key spare parts access for professional repairers for at least 7 years after selling the last unit of a model (up to 10 years for washing machines and select parts in other products). This will make many more repairs viable. Crucially, design for disassembly survived the process, creating a major precedent for the right to repair. From 2021, new appliances put on the market in Europe will have to be designed by allowing the replacement of key spare parts using commonly available tools, without causing permanent damage to the appliance. Design for disassembly is the foundation of any strategy to achieve longer-lasting appliances. We cannot underestimate the impact of this win! And we will push to ensure it is applied to future ecodesign product regulations, including laptops. However, we were in for a massive disappointment, as successful pressure from industry lobby groups has severely limited access to spare parts and repair information for non “professional” repairers. The regulations also grant producers the final say on who qualifies as “professional” for member states without a registry listing all professional repairers. Additionally, the regulations allow manufacturers to restrict access to repair manuals, as well as spares, for the first 2 years from a product’s launch, retaining an initial monopoly on repairs, irrespective of the warranty status. Read the statement by the European Environment Bureau here. To make things more “real”, here are a few examples illustrating our mixed feelings about the new ecodesign regulations. If the light inside your fridge stops working, as you will not be able to buy a replacement directly and replace it yourself. The regulation only gives professional repairers guaranteed access to spare light bulbs. If your television breaks, you will only be able to buy external power supplies (kettle leads) and remote controls. That’s it! All other spare parts, including anything inside of the television, will only be accessible to professionals. If you smash your television screen, manufacturers will not have to provide replacement screens – not even to professional repairers. If you suffer a software or circuit board fault on your fridge, dishwasher or washing machine, the new measures will bring game-changing access to replacement boards and to software, making many more commercial repairs possible. If the ball bearing goes on your washing machine, the regulation allows manufacturers to “bundle” multiple spare parts together, with big negative consequences. It means that manufacturers might force a commercial repairer to buy the whole, sealed drum plus ball bearing. And this probably renders the repair economically unviable. Lastly, if you are trying to buy a new fridge, television, dishwasher or washing machine, lack of access to repair manuals and spare parts during the first 2 years since a product’s launch might limit your ability to make informed decision about what product to purchase. Defra minister Thérèse Coffey publicly pledged her support for the ecodesign measures, and Defra told the BBC it was planning on adopting “similar measures” post-Brexit. This is encouraging. But together with all of the signatories of the Manchester Declaration we would like more of a clear commitment than this. Can we expect full, continued alignment with European standards? What enforcement mechanisms are in place to ensure we do not become a dumping ground of sub-standard products? If the UK would like to exceed the EU measures, the way forward is clear: the UK could easily extend access to spare parts and repair information to all consumers, not just professional repairers. Make the right to repair and access to replacement parts available to all. Also the bundle of parts is a “rip off”. It makes more waste which we don’t need more of. And a way for manufacturers to make more money by selling unnecessary parts. Like I said, a “rip off”.